Pioneers in the industry, we offer Hypertherm Plasma Consumables, Thermal Dynamic Plasma Consumables, Koike Plasma Consumables, Kjellberg Plasma Consumables, Cebora Plasma Consumables and Messers Plasma Consumables from India. We offer best quality Hypertherm Plasma Consumables, which are durable and come at affordable rates. Customer satisfaction is of the prime importance at EXCEL Metal and so supreme quality material is used for manufacturing the Hypertherm Plasma Consumables. EXCEL Metal is one of the leading manufacturers of Kjellberg Plasma Consumables, which is manufactured with superior quality material. Reasonable pricing and quality is synonymous with our product Kjellberg Plasma Consumables. We manufacture Cebora Plasma Consumables of supreme quality keeping in view the current industrial standards. To ensure optimum customer satisfaction, our team of experts designs Cebora Plasma Consumables with high precision. High quality material is used in the production of Messers Plasma Consumables. Quality test is carried out to guarantee durability and reliability of the Messers Plasma Consumables as they are supplied to important industries. The Panasonic Plasma Consumables, which is manufactured at EXCEL Metal is in high demand due to its finest quality. The Panasonic Plasma Consumables are made keeping in view national and international standards, robustness and reliability. 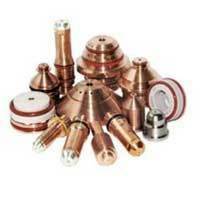 EXCEL Metal range of ESAB Plasma Consumables is made of finest quality material. ESAB Plasma Consumables is fit to be used in different industrial applications. EXCEL Metal manufactures best quality EP Plasma Consumables, which are robust, long-lasting and comes at an affordable rate. Customer satisfaction is of chief significance at Metal Industries’ and so the supreme quality material is used for manufacturing the EP Plasma Consumables. EXCEL METAL we specialize in accurately designed AP Plasma Consumables. The AP Plasma Consumables are greatly appreciated for their durability and reliability by the clients all over the country. The TC Plasma Consumables belonging to EXCEL Metal is reputed to be a high-end quality product available in the market now. We offer this range of products at competitive market prices. EXCEL Metal is meticulously designed for your Cut 40 Plasma Consumables. These consumables are made using high grade material and are highly appreciated for their reliability and consistency. Stainless Steel in 304, 304L, 316, 316L, 309, 309L, 310, 347 etc. from size 1.6 mm 2.0 mm, 2.4 mm, 3.0 mm, 3.15 mm. Pure, Silicone based 5%, Hi Silicon, 5% Mg, in all sizes from 1.6 mm, 2.0 mm 2.4 mm, 3.15 mm, 4.0 mm, 5.0 mm, 6.0 mm. Tungsten Electrodes 2% Thoriated or Zirconated range 1.6 mm, 2.0 mm, 3.0 mm, 4.0 mm, 5.0 mm, 6.0 mm, 8.0 mm, 10.0 mm, 12 mm.